Gary Barker on Smooth Nu Cat Hart Photography. 2018 Lucas Oil NCHA Super Stakes � April 11, 2018 � Fort Worth, Tex. Gary Barker, Madill, Okla., scored 224 points on Smooth Nu Cat, by Smooth As A Cat, to win the 2018 Super Stakes Classic Amateur Unlimited. Jacob Taurel, Whitesboro, Tex., claimed the reserve title with 223.5 points aboard Little Jewels Olena, by Athena Puddy Cat, while Danny Jones, Alberta, Can., and Play Miss Boonsmal, by Peptoboonsmal, placed third with 223 points. 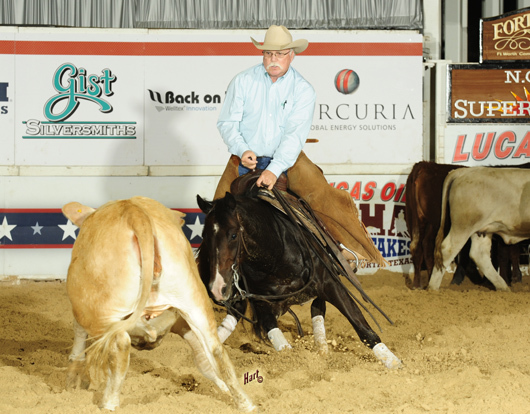 Matt Gaines showed Smooth Nu Cat for Gary and Shannon Barker as an open finalist in the 2015 NCHA Futurity, as well as the 2016 Super Stakes and NCHA Derby, and the 2017 Breeders Invitational. It was in 2017 that Barker started showing the gelding and racked up an impressive record as champion of the Cotton Stakes 5/6 Non-Pro, as well as champion of the West Texas Futurity 5/6 Amateur Unlimited, reserve champion of the Cotton Stakes 5/6 Amateur Unlimited, and a top 10 finalist in the Pacific Coast Futurity 5/6 Non-Pro; the Pacific Coast Futurity 5/6 Amateur Unlimited; the Non-Pro Cutting 5/6 Non-Pro; and the NCHA Classic Challenge Amateur Unlimited. The Barkers bred Special Nu Cat, as well as 2016 NCHA Futurity Open champion Second Spot LTE $274,686, also shown for them by Matt Gaines, and Sticky Spot LTE $108,982, the 2011 NCHA Super Stakes Open reserve champion. Special Nu Baby LTE $481,197, the dam of Smooth Nu Cat, won the 2015 NCHA World Championship with Gaines and was inducted into the NCHA Hall of Fame. The dam of six NCHA money earners, Special Nu Cat, with $143,681, is Special Nu Baby�s top money earner. Gary Barker is the NCHA earner of $544,787. Jacob Taurel on Little Jewels Olena. Hart Photography. Jacob Taurel was a 2017 NCHA Super Stakes Amateur Unlimited finalist (6th) with Metallic Martinis, by Metallic Cat. Taurel, the NCHA earner of $149,207, also won the 2016 Bonanza 4-Year-Old Amateur Unlimited on VV Hellcat, by Smoother Than A Cat, and the 2015 Breeders Invitational 4-Year-Old Amateur Unlimited on WH Cat And Mouse, by Wild Haired Cat. Five-year-old Little Jewels Olena, by Athena Puddy Cat, carried David Taurel as reserve champions of the 2017 Brazos Bash 4-Year-Old Amateur, and as an Amateur finalist in the 2017 NCHA Derby and the 2017 West Texas Derby. 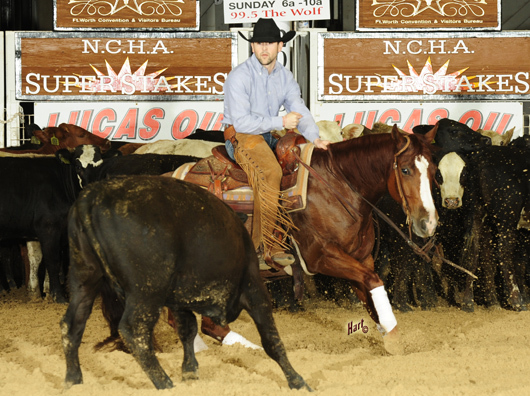 Danny Jones, NCHA earner of $505,199, and 6-year-old Play Miss Boonsmal came into the Classic Amateur Unlimited Finals off of a 223-point first go-round score and a 221-point Semi-Finals score. They also claimed the 2018 Cattlemen’s 5/6 Amateur Unlimited championship and the 2017 Brazos Bash 5/6 Amateur Unlimited championship, and had placed (4th) in the 2016 NCHA Super Stakes Amateur Unlimited. Play Miss Boonsmal, the earner of $137,380, has also had a successful Open limited age event career for Jones under Eddie Flynn.